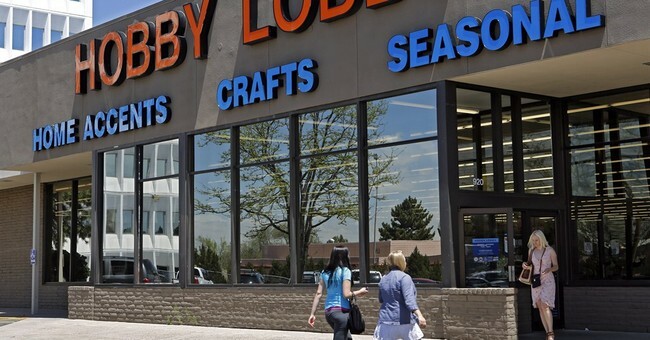 Hobby Lobby: Should Employers be Forced to Provide Abortifacients? The U.S. Supreme Court heard oral arguments last week in the Hobby Lobby case, to decide whether a business that provides health-care insurance to its employees can be forced to include abortifacients in its coverage. Hobby Lobby filed a lawsuit against the federal government over the Obamacare mandate of providing abortifacients. Hobby Lobby is a family-owned arts and crafts store, run by Christians based out of Oklahoma. The family has devoted itself to Christian mission work, and Christian music is played over the loudspeakers in its stores. The owners are not Catholic, and aren’t even objecting to providing contraceptives, it is solely the abortifacients that they have a problem providing, believing that a fertilized embryo is a human life that must be protected. Conestoga Wood Specialties, also owned by Christians, is part of the lawsuit. There is no legitimate concern, and it’s frankly a waste of taxpayers’ money that this has to go to court. In today’s Internet society, any woman can purchase dirt-cheap abortifacients online without a prescription, or from Planned Parenthood and other women’s clinics for free or low cost. They can also take an increased dosage of contraceptives to act as an abortifacient, since that is all abortifacients are. There is zero reason to force an employer to include abortifacients in coverage. Most health insurance through an employer includes a co-pay, and since abortifacients have been made so commonplace, women are probably better off finding it discounted somewhere else. Employees of Hobby Lobby also have the option to choose Obamacare instead of their employer’s health insurance. The reality is, this is not about women’s rights or helping women, or even helping women obtain abortifacients. As a practical matter, it makes zero difference to the female employees of Hobby Lobby whether they receive abortifacients through Hobby Lobby’s health insurance. This is solely about threatening and intimidating Christians, not just in public but now in the workplace, in their places of business. It is about power and control from the central government to dictate its morals on everyone else. As government continues to grow bigger and bigger, affecting virtually every part of our lives, there will continue to be more and more ways to stamp Christianity out in the name of women’s rights, not offending anyone, and other straw-man arguments. 99 percent of American women have used contraception. They know how to get it and there aren’t problems with access to contraception or abortifacients. Liars like Sandra Fluke have helped expose the dishonesty, with her attempt to force Georgetown University to provide contraception - and for free. It reveals how far the left will go to harass Christian universities and businesses. No one believed for a second Fluke’s testimony that women would have to pay over $3,000 for contraceptives while in law school if the Catholic university didn’t include them in its health insurance plan. The vast majority of women are likely insulted that businesses like Hobby Lobby are being harassed by the government using the pretense of women’s rights, when everyone knows it’s a smokescreen to force anti-Christian viewpoints on Christian companies. Justices Sonia Sotomayor and Elena Kagan, two of the liberal feminists on the court, asked questions suggesting that if Hobby Lobby prevails, then other businesses could refuse to provide transfusions and vaccinations. This is inaccurate and a red herring. Columnist Cal Thomas spoke to Joshua D. Hawley of the University of Missouri School of Law and counsel to the Becket Fund for Religious Liberty about the Religious Freedom Restoration Act (RFRA). Hawley told him that RFRA, which was passed into law in 1993, protects religious objectors, but only if they can show a substantial burden and the government has a compelling interest with no other viable means of achieving it. Since blood transfusions and vaccinations can mean the difference between life and death, it is unlikely that an employer would be able to refuse to include them in health insurance coverage. On the other hand, there is no compelling state interest when it comes to abortifacients, as well as birth control, since it’s so widely available. The feminist justices’ argument is a bit ironic when one considers this is solely about abortion, not even contraception. Where is the compelling state interest to protect the life of the embryo? The Obama administration argues that RFRA doesn’t apply to Hobby Lobby, since it was only intended to protect individuals and religious organizations. However, the courts have recognized that corporations have some First Amendment rights. Hobby Lobby could choose not to offer health insurance to its employees, pay a fine, and let its employees fend for themselves with Obamacare, but the company and its compassionate Christian owners would rather not leave its employees subject to that bureaucratic nightmare. Opponents of Hobby Lobby assert that the morning after pill is merely contraception, not an abortifacient, but that is not true. The morning after pill, also known as Plan B, can destroy an egg after it has been fertilized and become an embryo. This is not about Christians discriminating against others, this is the reverse; anti-Christians targeting Christians and imposing their viewpoints on them. There are seeds of tyranny in Obamacare, forcing men and women to go against their consciences. Liberal law professor Alan Dershowitz and conservative attorney Ken Starr understand what is at stake here. Dershowitz and Starr put on a symposium last week about the Hobby Lobby case, and amazingly, they both agreed that the government was intruding too much.